With Peace Plan In Tatters, Kofi Annan Resigns As Syria Envoy : The Two-Way Annan could never bridge divisions both in the country and within the United Nations Security Council. UN-Arab League envoy Kofi Annan looks on before a meeting at his office at the United Nations Offices in Geneva. As the international envoy to Syria, Kofi Annan was supposed to bridge divides and bring peace and perhaps even a political transition in the country. But his role was an exercise in frustration with both the regime of Bashar Assad and the rebels ignoring ceasefire agreements. On the diplomatic front, he was also stymied by the gulf that existed between Russia and China and the rest of the U.N., which supported tougher sanctions against Assad. With the violence in Syria escalating, and his peace plan all but failed, The New York Times reports that Annan said he would not renew his mandate when it expires Aug. 31. 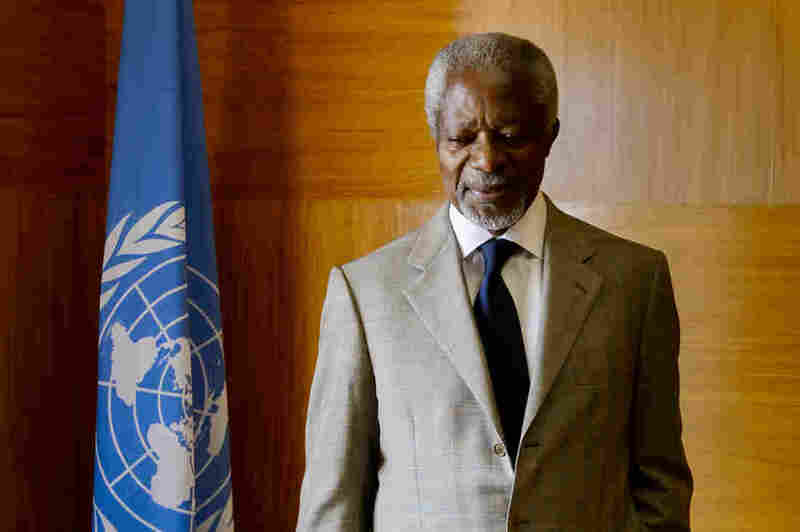 To Reuters, Annan complained about "finger pointing and name calling" within the Security Council. But said perhaps the U.N. and the Arab League could find a replacement. "The world is full of crazy people like me. So don't be surprised if Secretary General Ban Ki-moon can find someone who can do a better job than me," he told Reuters. He added: "here may be other plans, other approaches that may work quite effectively." "Tragically, the spiral of violence in Syria is continuing. The hand extended to turn away from violence in favour of dialogue and diplomacy — as spelled out in the six-point plan — has not been not taken, even though it still remains the best hope for the people of Syria. Both the Government and the opposition forces continue to demonstrate their determination to rely on ever-increasing violence. In addition, the persistent divisions within the Security Council have themselves become an obstacle to diplomacy, making the work of any mediator vastly more difficult." Russian President Vladimir Putin said he hoped the international community would continue to try to broker a peace deal. "Kofi Annan is a very respectable person, a brilliant diplomat and a very decent man, so it's really a shame," Putin said, according to Reuters. The United States pinned Annan's failure on Russia and China. U.N. Ambassador Susan Rice expressed those frustrations on Twitter. "Those who blocked #UNSC from heeding Annan's calls for consequences for non-compliance with prior resolutions made his mission impossible," Rice tweeted.